Mr. Nikolaos Karamouzis is Chairman of the BoD of Eurobank Ergasias S.A. and Chairman of the BoD of the Hellenic Bank Association (HBA). At Eurobank he is also Chairman of the Strategic Planning Committee and Member of the Risk Committee and Nomination Committee. He is Member of the Legal Council and BoD Member of Eurobank Cyprus Ltd. 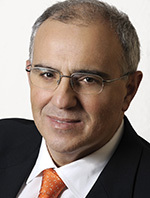 He is Vice Chairman of the Hellenic Federation of Enterprises (SEV), Chairman of the Hellenic Advisory Board, South East European Studies at Oxford (SEESOX), Oxford University, Advisory Board Member of diaNEOsis, Vice President of A.D.R. PROMOTION ORGANISATION - ADRO, BoD Member of Onassis Foundation, Board Member of Foundation for Economic and Industrial Research (I.O.B.E. ), Member of the Advisory Board of the Humanitarian Organization "Apostoli" by the Holy Archdiocese of Athens. He is Emeritus Professor, University of Piraeus in Greece. He holds a Bachelor in Economics, University of Piraeus, a Master Degree in Economics, American University, USA and Ph.D. in Economics with specialization in Monetary Policy and International Finance, Pennsylvania State University, USA.